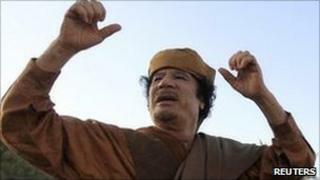 Image caption Col Gaddafi pledged to fight to the end - but from where? Libyan rebels as well as Nato officials will be hoping that the hunt for Col Muammar Gaddafi does not turn into a protracted affair. UK Defence Secretary Liam Fox has confirmed that intelligence assets will be deployed to try to stop that happening. These range from agents on the ground trying to pick up the latest reports and rumours, through to satellites watching for any convoys or unusual movement in the desert, as well as the interception of communications to see if any supporters or Col Gaddafi himself gives anything away. Mr Fox and officials have declined to comment on reports that the SAS has also been ordered to help with the search on the ground. A tip-off may still be the best hope of finding him though. Col Gaddafi released a message earlier this week, and that will also be analysed for any clues. He claimed he had come out undercover on the streets of Tripoli. That is impossible to verify. Rebels had said that there are indications he is in or around Tripoli, but no-one seems sure, and there has long been speculation that he might head to his hometown of Sirte to make his last stand. Others have speculated that he might use underground tunnels in Tripoli to either hide or make his way out of the city secretly. Some believe he may have headed south to sympathetic tribes, where he also might be able to leave the country. If he did manage to evade capture, it would make it harder for there to be a sense of victory and for a new government to get on with its work. His survival could also prove to be a cause for a resistance to rally. The precedent that worries officials is Iraq. There, Saddam Hussein managed to hide out for eight months, and his loyalists began to organise themselves, quickly being joined by al-Qaeda and other radical groups. The failure to capture Saddam was an open sore for the US but, equally, catching him did not end the violence. Hiding is possible for long periods. Osama Bin Laden proved that with close to a decade of being America's most wanted after 9/11. Hiding effectively requires some kind of support network and ideally a sympathetic population. But the more someone who is in hiding tries to communicate or do anything, the more likely they are eventually to be found by those looking for them. Col Gaddafi, mercurial and unpredictable, has always been focused on his own power and survival. What he intends to do next is as unclear as where he is.